The Skinny: A Chinese-American woman seeks to avenge her father's death and expose an immigrant smuggling ring in Daughter of Shanghai, a remarkably progressive portrayal of Asian Americans featuring screen starlet Anna May Wong. Review by Calvin McMillin: Considering the current status of Asian Americans in Hollywood films, Daughter of Shanghai is a remarkable cultural find. 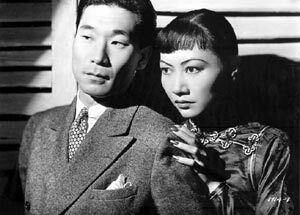 Given the film's "Oriental" theme, one half expects to see white actors in yellow face, yet Daughter of Shanghai is, in fact, a starring vehicle for Anna May Wong, the first Asian American woman to become a Hollywood star. Although some stereotypes remain, the film portrays Asian Americans in an extraordinarily positive manner, giving this standard B-movie plot an added element of cultural importance. Even better, it's actually pretty entertaining. The story kicks off when a group of thugs approach well-to-do Chinatown merchant Quan Lin (Ching-Wah Lee) in the hopes that he'll participate in their immigrant smuggling scheme. When Quan Lin rejects their offer, he unknowingly signs his own death warrant. Later in the evening, the thugs make an attempt on the lives of Quan Lin and his daughter, Lan-Ying Lin (Anna May Wong). Thought to be dead along with her father, Lan-Ying escapes unharmed and flees to the home of the wealthy Mary Hunt (Cecil Cunningham), a matronly woman whose friendship with the Lin family has always seemed sincere. Little does Lan-Ying know that the kindly Mrs. Hunt is actually the shadowy mastermind pulling the smugglers' strings! While FBI agent Kim Lee (Philip Ahn) is on the case, Lan-Ying decides to take matters into her own hands, following the clues all the way to the smugglers' island way station. Using both her wits and feminine charms, Lan-Ying succeeds in winning the confidence of her enemies, but soon learns she may need help in bringing her father's killers to justice.